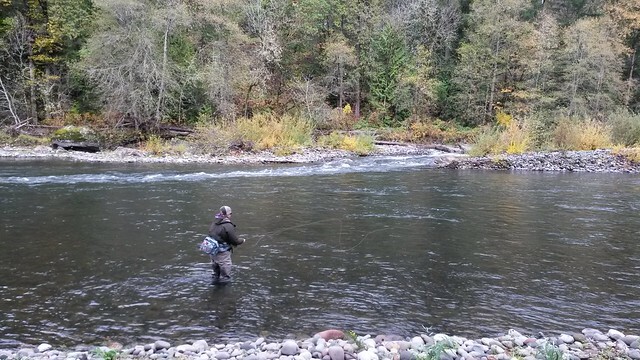 Despite all of the recent rains, the Middle Fork near Oakridge is still in good shape and the trout are still willing to eat a fly. On my recent trip to the Middle Fork, I was able to nymph up some respectable fish including a nice rainbow that was pushing 18 inches. Keep in mind that this is winter fishing and the water is cold, so make sure to work your runs thoroughly. The flies that were working for me were a #4 Black Jimmy Legs and a Rogue Ice Stone #6 as my top fly and a Little Black Sloan in a size 12 as the bottom fly. Don’t be afraid to lose a few flies during the course of a day. If you’re not losing a few flies you’re probably not fishing deep enough, keep them “bouncin” close to or on the bottom. Remember to dress warm and make sure you have a good rain jacket to keep you dry and block the wind. After a good day of fishing it’s nice to find an inviting place for some warmth and sustenance, and the town of Oakridge has just what you need. Brewers Union Local 180 is a English/American Public House with nice locals and is also family friendly. If you enjoy a good beer and some homemade food, Brewers Union is definitely worth checking out. They have real ale on cask and a host of tasty menu items that are sure to please your palate. Check em out. I’ve seen people use a big flo. red or orange bead head on a jimmy legs for steelhead too,….that thing gives me the creeps,….lol. Is this below or above dexter dam?